Reason is the conscious certainty of being all reality. Hegel's Idealism, Spirit and Unity (Synthesis of Thesis and Antithesis) is explained by the realism of the Wave Structure of Matter in Space. 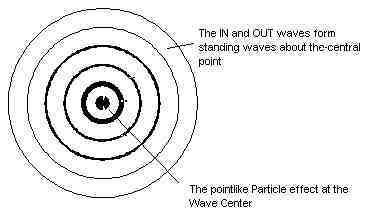 Uniting the 'particle' (Thesis / Wave-Center) and that which is not the particle, i.e. the 'field' (Antithesis / Spherical In Out Waves) as One thing (Synthesis / Spherical Standing Wave in Space). I share the view of Schopenhauer, that Hegel ultimately did more harm than good with his abstract and mystical view of reality. However, if you read the following quotes with the wave structure of matter in Space in mind you will find that it does actually make sense - reality is a dynamic unity, the discrete particle conception of matter is an illusion of the senses. Hegel's Idealism, Spirit and Unity (Synthesis of Thesis and Antithesis) is explained by Realism of the Wave Structure of Matter in One Space. Uniting the 'particle' (Thesis / Wave-Center) and that which is not the particle, i.e. the 'field' (Antithesis / Spherical In Out Waves) as One (Synthesis / Spherical Standing Wave in One Space). I appreciate this is a pretty abrupt explanation, but if you read on the Wave Structure of Matter I am sure you will understand why this is such a fundamental solution, not only to Hegel (and his attempts at unity by mind / spirit) but to all human knowledge (philosophy, physics, metaphysics). The Wave Structure of Matter sensibly explains this dynamic unity of reality by understanding how matter exists in Space and is necessarily interconnected to all other matter in the Universe (by its In and Out Waves). Basically matter is large (a structure of the universe) not a tiny 'particle' (which is caused by the Wave-Center). The significance of this. David Bohm explains things pretty well. Berkeley, George - Explaining Berkeley's Idealism from Realism of Wave Structure of Matter in Space. On how our Mind is Interconnected to our Body and all other Matter in the Universe.